Solid catalysts have long been called as “Magic stone”. Even though they are practically very important, their essential part of the catalytic mechanism has not still unveiled in many reactions. We have revealed the catalytic mechanism of various metal surfaces with our theoretical method. Figure shows concept of the Dipped-Adcluster Model (DAM) for studying the catalytic metal surfaces. With this model, we are studying the mechanism of the catalytic metal-surfaces and photocatalytic reactions. Dipped Adcluster Model for Chemisorptions and Catalytic Reactions on a Metal Surface, H. Nakatsuji, J. Chem. Phys., 87(8), 4995-5001 (1987). Dipped Adcluster Model for Chemisorptions and Catalytic Reactions on a Metal Surface: Image Force Correction and Applications to Pd-O2 Adclusters, H. Nakatsuji, H. Nakai, and Y. Fukunishi, J. Chem. Phys., 95(1), 640-647 (1991). 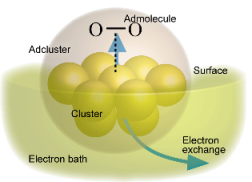 Dipped Adcluster Model for Chemisorption and Catalytic Reactions, H. Nakatsuji, Progress in Surface Science, Vol. 54, p. 1-68 (1997). Theoretical Study on Molecular and Dissociative Chemisorptions of an O2 Molecule on an Ag Surface: Dipped Adcluster Model Combined with SAC-CI Method, H. Nakatsuji and H. Nakai, Chem. Phys. Lett., 174(3,4), 283 (1990). Theoretical Studies on the Catalytic Activity of Ag Surface for the Oxidation of Olefins, H. Nakatsuji, Z. M. Hu, and H. Nakai, Intern. J. Quantum. Chem., 65, 839-855 (1997). Electron Transfer and Back-Transfer in the Partial Oxidation of Ethylene on an Ag Surface: Dipped Adcluster Model Study, H. Nakatsuji, K. Takahashi, and Z.M Hu, Chem. Phys. Lett., 277(5,6), 551-557 (1997). Activation of O2 on Cu, Ag, and Au Surfaces for the Epoxidation of Ethylene: Dipped Adcluster Model Study, H. Nakatsuji, Z. M. Hu, H. Nakai and K. Ikeda, Surf. Sci., 387 328-341 (1997). Mechanism of the Hydrogenation of CO2 to Methanol on a Cu(100) Surface: Dipped Adcluster Model Study, Z. M. Hu, K. Takahashi, and H. Nakatsuji, Sur. Sci., 442,(1), 90-106 (1999). Mechanism of Methanol Synthesis on Cu(100) and Zn/Cu(100) Surfaces: Comparative Dipped Adcluster Model Study, H. Nakatsuji and Zhen-Ming Hu, Intern. J. Quantum Chem., 77, 341-349 (2000). Theoretical Surface Spectroscopy of NO on the Pt(111) Surface with the DAM (Dipped Adcluster Model) and the SAC-CI Method, H. Nakatsuji, N. Matsumune, and K. Kuramoto, J. Chem. Theo. Comp. 1, 239-247 (2005).